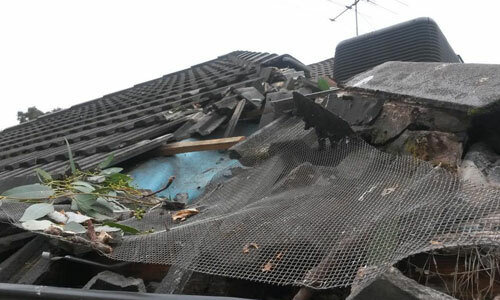 ​Property damage caused by an emergency can be scary, but we’ll get you through this crisis. Integrated Property Solutions can be at your side promptly, with experienced advice and the resources to put things right quickly. 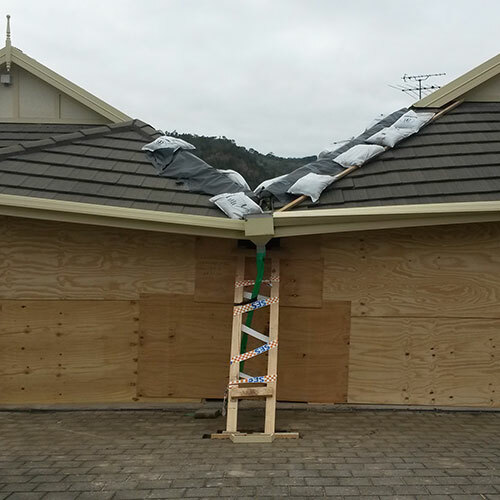 ​Because we’ve had years of experience in handling emergency property repairs, we’ve built a solid reputation as the people to turn to when you need help with your property. 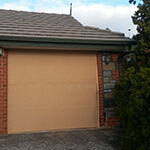 ​Integrated Property Solutions will Clean-up, Restore, and Repair your property FAST. Minimising the damage stress, while getting you back to business as usual. ​When you request our services, you can be assured that you are accessing years of professional expertise in the industry, with an experienced and reliable team. 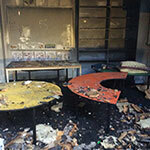 A fire can be a devastating blow to any enterprise. We have all the skills, experience and equipment needed to clean up and restore your property faster. 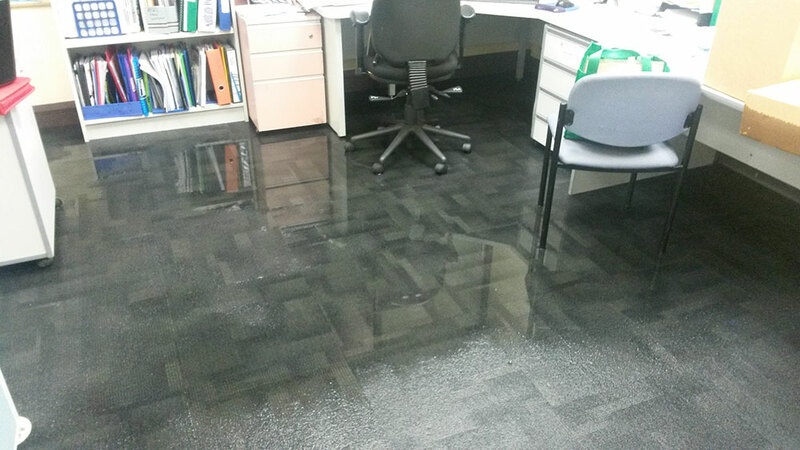 A flood event can significantly impact your operations for many weeks. 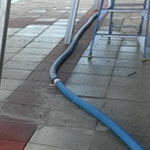 Our flood clean-up process is tried and tested to get fast results. When you turn to us, you get the best in the business. 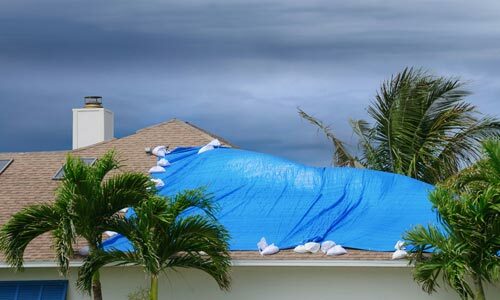 If your property has been damaged by storm, we are here to help you. From makesafe and insurance to complete restoration, we have what it takes to get you back on your feet. Toxic chemical or biological waste spills can be an alarming incident. But we’ve been there many times before, and know what it takes to get you clean and up and running again. 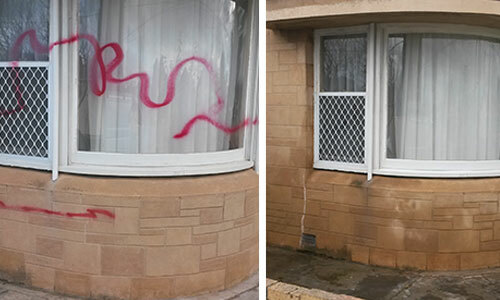 ​Because we’ve been one of Adelaide’s favourite emergency property restoration services for years, we’ve built ourselves a reputation of reliability, professionalism and importantly a considerate attitude during this stressful time. ​When you request services from Integrated Property Solutions, you can rest assured that you are accessing years of professional knowledge and expertise within the industry. Our core employees are experienced and reliable workers who have passed numerous induction and security checks guaranteeing you safe and rapid solution to your emergency needs. To help meet any specific challenge that may arise on a job, our response teams are ably supported by an extensive, specialist sub-contractor network, ensuring that Integrated Property Solutions can see any job through, from start to completion. An emergency situation can be many things, ranging from natural disasters to problems with hazardous materials and even transport incidents. Emergency response can refer to services provided by emergency and rescue services agencies such as the SES, as well as plans and actions taken within an organisation such as Integrated Property Solutions by one of our ERT’s (Emergency Response Team) to respond to an emergency. What does an emergency response team do? An emergency response team (ERT) is a collection of people who are highly trained within OH&S and disaster safety procedures. This training allows them prepare and respond to any emergency incident quickly, efficiently and safely. Natural Disasters or an interruption of business operations are some examples of events that will require an Emergency Response Team. Here at Integrated Property Solutions we want you to fully be informed about time frames for our response. To help the client get an estimate on the response time to their emergency we operate on a three-tiered priority system. Onsite with in 1 hour of the call. Onsite within 2 – 4 Hours of the call. Onsite by end of the day if before 1pm or 1pm next day. From simple burst pipes to full-scale flood and contamination, we’ve seen it before and done the job right. All of our skilled response workers are thorough, professional, and have all the necessary security and clearance checks, giving you peace of mind in an emergency. We are your reliable partner – you can turn to us when things go wrong. We will get on site and fix the problem, no matter how big or small, so that you can worry less and get back to business sooner. 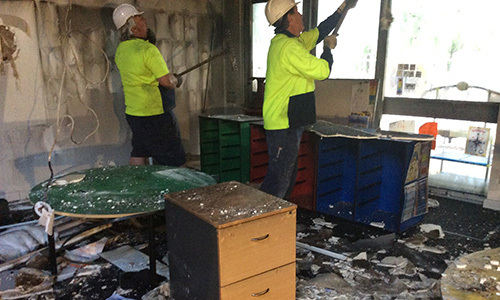 Due to the destructive nature of floods, specialised care is required during the clean up process. Below we'll provide you some information the way that floods are dealt with, what you can expect after the initial clean up and some of the health hazards involved in floods. 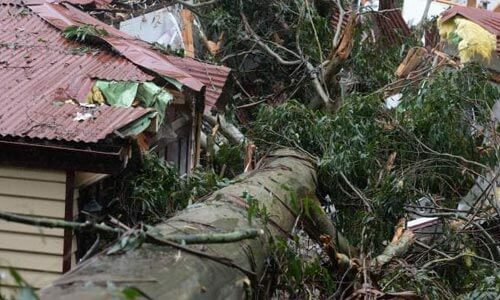 Removal methods used when responding to a flood are very dependent on many variables, including the category of water, the building that has been flooded and how long said water has remained stagnant. Quite often it is not the flood itself that is the most destructive, but the damage the stagnant water creates when it isn’t quickly removed. For example, as long as carpet has not been wet for longer than 48 hours, and the water involved was not sewage based, you can usually save the carpet; however, if the water has soaked for longer, then your carpet is probably irreparable and will have to be replaced. Restoration can be performed by Property management teams, building maintenance personnel, or by the Homeowners themselves; however, contacting a certified professional water damage restoration specialist, such as Integrated Property Solutions, is often regarded as the safest way to restore water damaged property due to their training and extensive experience. Most are usually listed under “Fire and Water Restoration” and they can help speed repairs, whether for individual homeowners or for the largest of institutions. Fire and Water Restoration companies are regulated by the appropriate state’s Department of Consumer Affairs – usually the state contractor’s license board. What Should I expect to happen after the Initial Clean Up? Different removal methods and measures are used depending on the category of water. Due to the destructive nature of water, restoration methods also rely heavily on the amount of water, and on the amount of time the water has remained stagnant. For example, as long as carpet has not been wet for longer than 48 hours, and the water involved was not sewage based, you can usually save the carpet; however, if the water has soaked for longer, then your carpet is probably irreparable and will have to be replaced. Restoration can be performed by Property management teams, building maintenance personnel, or by the Homeowners themselves; however, contacting a certified professional water damage restoration specialist is often regarded as the safest way to restore water damaged property due to their training and extensive experience. Most are usually listed under “Fire and Water Restoration” and they can help speed repairs, whether for individual homeowners or for the largest of institutions. Fire and Water Restoration companies are regulated by the appropriate state’s Department of Consumer Affairs – usually the state contractor’s license board. What are potential Health hazards? 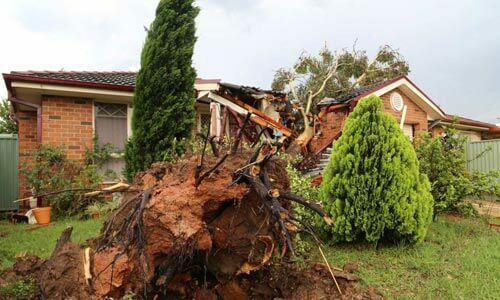 Secondary damage is a large concern when discussing flood damage, secondary flood damage is any damage to property caused not by the initial flood, but damage caused thereafter. This damage can take anywhere from months to years to fully comprehend. Slight discolorations on the walls and ceiling may go unnoticed for a long time as they gradually spread and get more severe. Even if they are noticed, they often are ignored because it is thought that some discoloration will occur as a part of normal wear and tear in a home. Different kinds of Mould can spread throughout the living space leading to serious health consequences. Symptoms caused by mould allergy are watery, itchy eyes, a chronic cough, headaches or migraines, difficulty breathing, rashes, tiredness, sinus problems, nasal blockage and frequent sneezing, mould also has the potential to be fatal if left untreated. 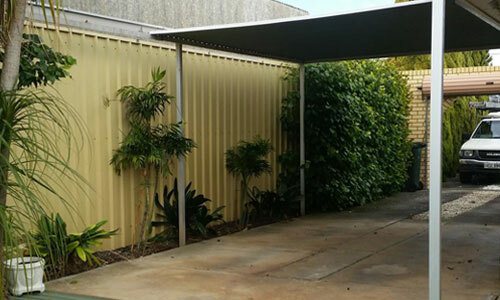 Skilled & Licensed trades people are trained in Flood Remediation and they have the technical know how, and equipment necessary to remove or minimise the risk of any secondary damage.